Morning, hope your all well today. The weather here on the wirral is awful, but i knew it would be it's my day off, oh well I'll have a crafty day.This is my entry this week for the Sketch Saturday Challenge and also Stampin for the weekend where the challenge was to use a digi image. 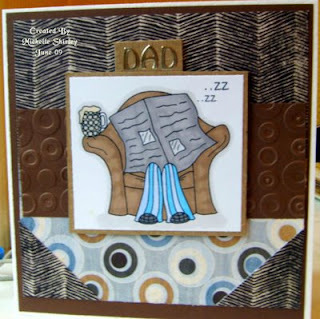 The papers are basic grey and the image is Jim from the digi stamp boutique, coloured with pro markers. Brilliant image for a Father's Day card! I love the colours you've used and the embossed panel. Thanks for joining in at the SFTW challenge this week. Lovely card Shell for a male card, your coloring is wonderful on it. It's nice to see some funny images now and then. Great choice of papers too for your card. Thank you for participating in the "Stampin' for the Weekend" challenge this week.. Good luck and we hope you'll continue to join in on the challenges on a weekly basis. Have a lovely day. Fabulous card Shell and your colouring is beautiful on this fun image. Your papers are perfect and your embossing is such a beautiful detail. Thank you for joining us at "Stampin´for the Weekend" and we hope you will play along with us next week too. Great card! I like that image and your choice of papers is perfect to set it off. Thank you for joining us at stampin for the weekend and good luck. Brilliant card. Love the digi stamp. Great papers and I really like the layout. Thank you for joining our challenge at 'Stampin' for the Weekend' this week. We hope you will continue to join us on a weekly basis. Good Luck. Enjoy the rest of your day!